Whisk ground flaxseed & warm water, let sit for 3 minutes. Mix Earth Balance and sugar together. Add flaxseed mixture. Blend in extract and food coloring. Combine dry ingredients, and add until well blended. Shape into a flattened ball. Wrap in plastic wrap and chill at least 1 hour. Pre-heat oven to 350. Roll out onto lightly floured board until approx. 1/4″ thick. Cut into heart shapes with cookie cutter. Place on parchment covered baking sheet about 2 inches apart. Bake until golden brown, about 10-15 minutes. Cool. Stir together confectioner’s sugar, corn syrup and milk until smooth. 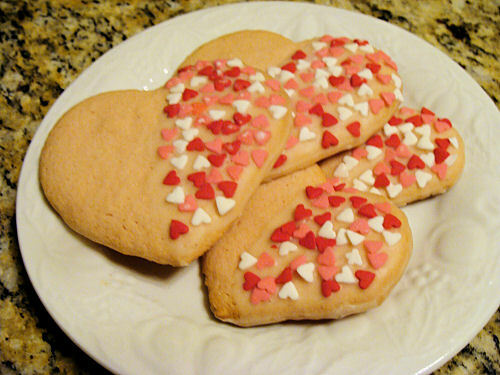 Dip half of a cookie into icing, then set on waxed paper and sprinkle with heart-shaped candies. Let dry about 1/2 hour. Repeat with the rest of the cookies.